Enjoy the gift of choice with the Virgin Experience Days Gift Card, available in denominations from £5 to £500 to spend across the complete Virgin Experience Days range. It’s the whole world of Virgin Experience Days (over 2,000 experiences) in one amazing little card – usable on treats like flying down a track in a Ferrari, soothing yourself in a Champneys spa, enjoying a Chocolate Making workshop and feeling fancy with dinner at The Ritz. Our catalogue is crammed with a never-ending choice of experience days, all handpicked by our dedicated buying team to ensure only the most memorable make it through. 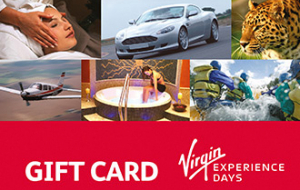 Get out there and do something extraordinary, all with the Virgin Experience Days Gift Card. Online: Select your experience at www.virginexperiencedays.co.uk at the checkout page select 'gift card' as the payment method and enter your gift card number and security code. Use the amount loaded on your Gift Card as full or part payment. Phone: Should you prefer an old-fashioned phone call, just ring 0844 504 0844 to buy your chosen experience over the telephone, using your gift card details when it comes to payment.